If you want to make a statement this summer, then the BULL BBQ® outdoor deluxe is the ultimate centre piece. Larger than life, smooth flowing lines with everything you need to show off your cooking skills whilst entertaining friends or family. The genuine BULL BBQ® unit is equipped with a whopping 4 main burners, 1 x side burner for WOK or re-heating, stainless steel serving trays, back burner fully equipped with 240V rotisserie, accurate temperature gauge, electronic igniter, you will have everyone in awe with this little gem. 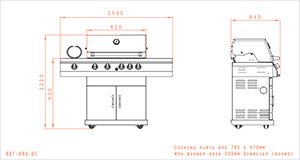 This genuine BULL BBQ® has been fully approved by Australian Standards and carries the AGA certification, your genuine BULL BBQ® Compact Deluxe 80% assembled, and is constructed of Stainless Steel using a combination of 202, 304 and 420 grades. Sleek design and striking appearance does not end on the outside either, as all internal components including flame retarders along with the full length slide out drip tray are all made of 100% stainless steel meaning your genuine BULL BBQ® is built to last a life time. You can also view and pick up this item from our warehouse located in the Wollongong area, for more info and directions please call our office on 02 4257 4787. Very happy with the product. Spit works great. Reasonably easy to put together. Easy to assemble and a breeze to keep clean, my new Bull BBQ is the perfect centerpiece for all of my get togethers with friends and family. Complete with cover, it will provide me with somewhere to rest my stubby for many years. Great BBQ so far, side burner very powerful and rotisserie made an awesome leg of lamb! Very prompt and efficient delivery. I like how the BBQ was mostly assembled - it was up and running within the hour. Good looking BBQ and functional as well. Rotisserie burner is a great extra. All stainless steel means long life BBQ. Looking forward to learning to cook lots of different meals for the family. Great BBQ, great price, great service. Couldn't be happier!